Service is one of our core values at All Saints Academy and a part of life both within and outside school. Recently our kindergarten through 8th grade students and families assembled 1500 bags (145 lbs) of trail mix for our current school community service partner, Kids Food Basket. 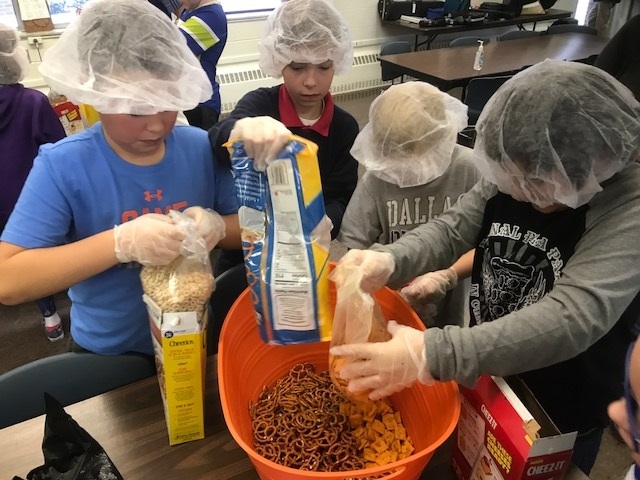 In middle school students participate in a Service Corp project. Service hours can be logged at any time. They are due on June 1, 2018 for grades pre-k through 7th grade for the 2017-2018 school year. For graduation award tallying purposes, 8th grade service hours are due May 23, 2018. Service Hour Paper Log Sheet. A Sheet may be downloaded and printed from here, it is available on the Forms and Documents page on the school website, or copies can be picked up in the school office or from homeroom teachers. Forms can also be turned into the school offices or homeroom teachers. When students have completed a service activity, be sure they add the activity to their Service Log Sheet. The Service Log Sheet should be signed by the adult in charge of the activity. Parents may sign for service activities as appropriate. Talk to your child about service and help them come up with ideas of how they might fulfill their requirement. Please be open and creative in service. There are no assigned strict definitions for what is and what isn’t service. Please use the Works of Mercy, focusing on the Corporal Works of Mercy as guidelines. Questions? Contact your student’s homeroom teacher. ASA Mission Statement: All Saints Academy is a Catholic School inspired by the Holy Spirit and dedicated to teaching and living as Jesus did. Our mission is to serve and partner with our families, parishes and communities as we focus on the spiritual, intellectual, moral, social, and physical development of our children.